I arrived the Kansai airport from Haneda on the evening of Nov. 19th. Then I flew to Dubai and now arrived at Alexandria, Egypt. This was my 3rd visit to the Dubai airport in last 4 weeks. I arrived at Alexandria on the 20th at 11:30 and headed directly to the Alexandria Library. This about 2300 year’s old library is the world’s first scientific academy, and the magnificient buliding was reconstructed 5 years ago. The contents have also been reinforced under the leadership of Dr. Serageldin, the library chief. He is also my friend and has developed several excellent programs. I am also a member of the Board of Trustees of the library for past 3 years and I visit this place for the meeting conducted in spring. I arrived to the Library just in time. I had an interview from 1:00 pm with Mr. Helal, the Education Minister of Science and Technology. I have met him several times in past few years. He is a scholar and a splendid person. There is a considerable support from Japan. It is delightful to hear that an opera house is being constructed recently in addition to the plans of establishing a science and technology institute with the support of Japan. I mainly discussed about the academic exchange with Minister Helal. There were about 120 people from Japan and 150 people from Arab countries participated in the Japan-Arab conference. 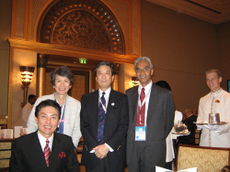 The conference had various sessions and sub-sessions and a full discussions were conducted about a wide range of topics, such as politics, economics, science, technology, environment, health care, culture, and art, etc.. From Japan, the group was headed by honorable former MInister Mr. Taro Nakayama besides honorable former Ministers, Mr. Koji Omi, Ms. Yuriko Koike. From the business sector Mr. Jiro Nemoto of honorary chairman of Nippon Yusen, Mr. Sadao Umeda of chairman of Kajima Corporation. 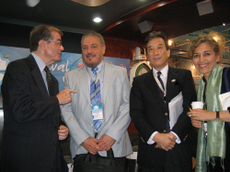 Dr. Masahisa Yamauchi, a professor of Middle East politics, Mr. Daisuke Nishimura, a foreign ministry environment personnel, and Mr. Youji Yamada, a film director who directed "The Twilight Samurai" was also present since this film was to be shown there. I chaired the environment and water panel and went to several panels. I was happy that several people I know had come as representatives from the Arab world. Also I have a good time with former Ambassador Mr. Arima Tatsuo, the busy Japanese government representative on the MIddle East Affairs. We had planed to meet up before but our timelines never matched until this time. Needless to say that Mr. Ishikawa, an ambassador to Egypt, and from the Ministry of Foreign Affairs, Mr. Katakura and Mr. Sudou, the former ambassadors to the embassy of Egypt, participated. 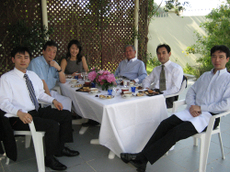 This kind of gathering of three ambassodor was extremely rare as I was told. Also, an ambassador to Morocco, Ms. Haruko Hirose(Also introduced in the blog of Ms. Mayumi Moriyama, a member and worked as No.2 in UNIDO) had come over there. Since she is working with the United Nations for a long time, even a minor opinion she say shows a fine taste on international relations. Historically, there has been little religious conflicts between the Middle East and Japan. 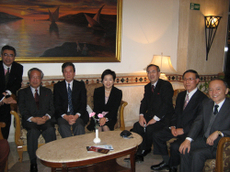 Since good relations are built from the past, it is a region in which mutual exchanges need to be continued.and strengthened The basic understanding with both parties is that current exchange with Japan is solely in relation to petroleum, and Arabs are not very aware of Japan and vice versa. It was agreed that there should be more and more exchanges in various fields. In addition to this, it was also agreed that the contribution of Japan towards environment, clean energy and water problems was immeasurable. A congress member, Ms. Yuriko Koike, appeared live-broadcasting on the Cairo T.V. on the night of 21st about an hour. There was one to one interview in Arabic and the theme was about “global warming” and “CoolBiz” in fluent Arabic language which actually was quite something. A tree plantation is going on in the deserts from past 10 years and currently there seem to be 14,000 trees now. 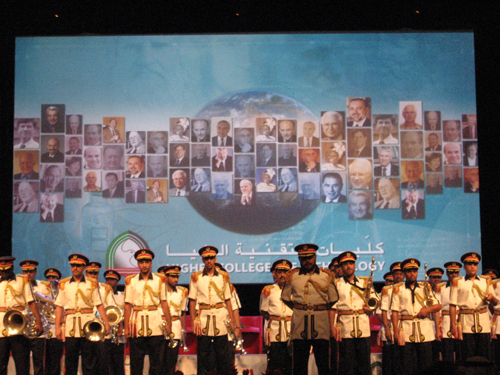 This year, the Cairo University is celebrating its 100th anniversary. 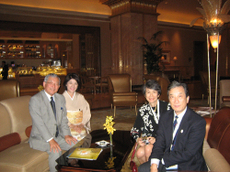 Ms. Koike, a graduate of Cairo University, is quite admirable that she has many friends and influential people over here. On the afternoon of 22nd, I left Cairo. 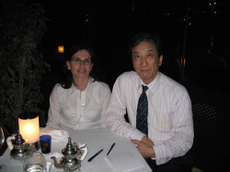 Since I had a time at Dubai about 5 hours for transit, I had dinner with Ms. Lama Farsakh(Photo3). She is from Palestine and her husband is from Egypt. They have two daughters. We mostly talked about the Israel-Palestine issues. In the week of Nov 12, I had an opportunity to give speeches everyday in the week. On 13th (Tuesday), I was at the Future Innovation Forum. On 14th (Wednesday), I was at the Sir Martin Wood Certfication cermony in the British embassy and I gave a speech about the lifestyle related diseases on the 15th (Thursday). The Sendai city is in collaboration with Finland. On the 16th (Friday), a symposium was conducted by both the hosts with a theme "The Aged Society." There seem to be several issues regarding it. The Finnish Ambassador to Japan, the Sendai city mayor Mr. Katsuhiko Umehara (he was at the Ministry of Economy, Trade and Industry before becoming a mayor) also addressed the symposium. One of the deputy mayors (2 out of 3 are females), Emiko Iwasaki (She is a doctor who is seems to have been to Africa. The mayor had recruited her which is amazing), myself and a person from Finland gave a keynote speech. In Japan we have major problems of declining birthrate and also delayed social progress of women. But nothing has been done about it. The women activity in Japan is in stark contrast to Finland. In the afternoon, I headed to Tokyo for the speech "Scienctific technology and the nation" on the 50th anniversary of Asahi newspaper science department. I participated in the panel after the key speech "Out of the frying pan into the fire" given by Mr. Takashi Tachibana. I was back to Sendai the next day. There was an invitation from Dr. Noriko Osumi at the Tohoku University meeting "The 6th Gender equality symposium" and a male delivered a keynote speech for the first time. The panel consisted of eminent people. According to Mr. Tateo Arimoto ( JST, Japan science and technology agency), the Education Ministry seems to have complained when the first President of Tohoku Universty, Dr. Sawayanagi Masatarou enrolled females for the first time in the University, which was unheard before. 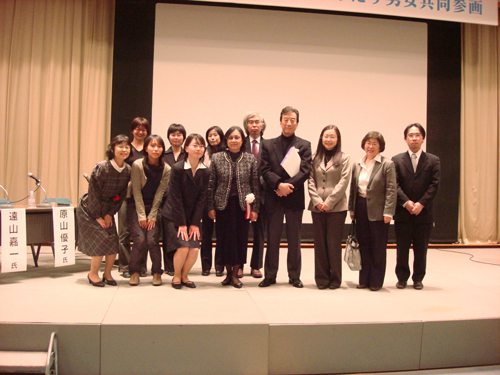 Tohoku University has a support program for female researchers called the Science Angels. There was again a presentation and award ceremony of "5th Sawayanagi Award (Tohoku University Gender Equality Promotion Award)" and the 3rd award winner gave a presentation. All of you have done a wonderful work. I am very happy. Congratulations. I have presented the image of the Tohoku University at that time. Please have a look at it. Both the Human Development Index and the Gender Development Index are as high as entering the Top 10 (UNDP etc.) of the world. The Gender Empowerment Index of Japan is ranked 43rd in the 75 countries of UNDP. It stands at the 91st of 128 countries in the recent World Economic Forum. It is a pity not to nurture the talents of women. 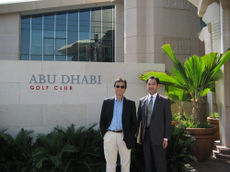 From Abu Dhabi－3; Dubai, and the Japanese environment technology. On Oct. 26th, I was in Abu Dhabi and then stayed in Beijing and arrived at Narita late at night. The following day, there was a meeting presided by Dr. Uzawa and I enjoyed this Saturday event. The next week Monday to Friday was very busy. Then I once again departed to Abu Dhabi in the early morning on Saturday. This time it was a very different task. At both Abu Dhabi and Dubai about twelve Japanese companies collaborated under the leadership of Nikken Sekkei Ltd. to display and introduce the environmental techniques which are pride of Japan. I gave a speech from the point of view of a scientist. However, to visit Dubai Airport and Abu Dhabi twice within ten days was something I never would imagine, despite the fact that there were many coincidences that led this to happen. After arriving in Dubai, a reception at the official residence of the consulate took place. After staying there overnight, I went to Abu Dhabi again after a gap of "10 days." 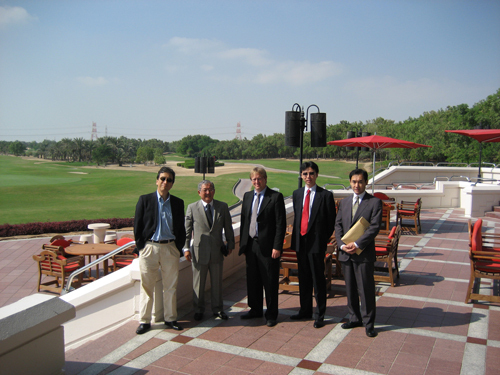 I met the Ambassador His Excellency Hatano, some businessmen, and the Director General of INSEAD Abu Dhabi School. I brought Japanese sweets for the students of the Japanese school as I promised at my previous visit and handed them through Mr. Yoshimura, the principal. At night there was an excellent Japanese display of the environmental techniques and a video introduction of a proposal of new urban development. There was also an interview with His Highness the Prince in between and after that I addressed to the gathering. The speech given by His Highness the Prince was very earnest and made us aware that more efforts were needed for education. A part of his thoughts now in action is to enroll the local students in the Japanese school and he seemed to be very thankful to Ambassador Hatano for sharing the same view. The climate in Abu Dhabi in this time of the year is very pleasant. It is somewhat like Los Angeles. 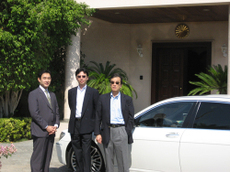 25% of Japan’s petroleum imports are from Abu Dhabi. On the other hand, there is a future urban development plan called MASDAR over here which in the long run does not emit CO2 by using clean energy. It is incorporated very ambitiously. This ambitious project was also reffered to in the speech. "Planet in Peril: Nation with Clear Vision as a New Global Leader of Sustainable Urban Development, Abu Dhabi and the United Arab Emirates"
The following day, I gave another speech which was slightly different and referred to the recent ambitious project "Enpark." I arrived at Narita at night on the 6th. Things that should be abundoned. So busy again this week. I thought to myself why is it so? I returned to Japan from the Middle East on the 6th (Tuesday). So it is a matter of course that I was busy as it was necessary to have the normal contacts, briefings and appointments with various people from the next day. On the 7th (Wednesday) afternoon, I had a video interview with Dr. Takeshi Yourou (will describe later). In the evening, a speech which I agreed to do because it was related to the inauguration of "Innovation Courier." It was great to be with Dr. Yonekura of the Hitotsubashi University. On the 8th (Thursday) morning, I met Dr. Hisao Endo at a scheduled breakfast meeting of the NPO Health Policy Institute which I preside. In the afternoon I met several people and discussed about work. In the evening there was a reception of the President Council of the University of Tokyo where chancellors of more than 10 universities of China and Korea attended. The vice minister of Ministry of Education of China was also there. It was a great success. The chancellor of the Uiversity of Tokyo, Dr. Komiyama is a very active person who speaks and acts toward public very positively. The next day on the 9th (Friday), I had a meeting of the President Council of the University of Tokyo. I met Dr. Yoshino of the Harvard Business School after a long time. I think the trend of the debate moved towards the direction I wished, but the speed is somewhat・・・. Although I understand, it is still irritating. In the evening was UCLA Alumni association meeting. 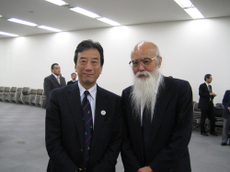 The Alumni members have increased under the leadership of Dr. Akada and it has become livelier. The young people are gradually participating and preparing together. It was raining since morning on the 10th (Saturday). I attended the 130th anniversary of the University of Tokyo at the Yasuda auditorium. A President Council was held for this and several people from overseas participated as members. There was also a panel by Nobel Prize winners, Drs. Esaki, Ooe and Koshiba. 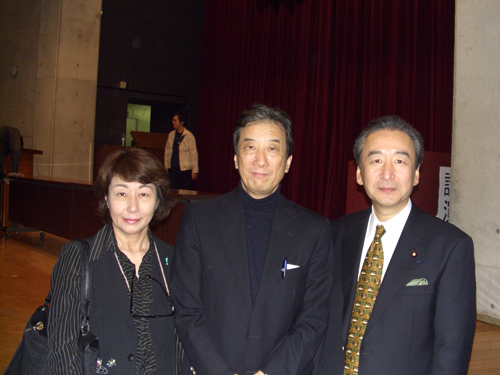 On 11th (Sunday), I gave a keynote speech along with Mr. Kamoshita, the minister of environment in a seminar of environment problems at the Sophia University (photo: with the minister Mr. Kamoshita and his wife). There was a lovely harp, cello and violin performance before and after the speech which gave a great feeling. I ended my speech with a note of Mr. Gandhi, 'the earth can meet our need, but not our greed' which received a huge applause. This has become a habit but I was again busy this week. I know I must make up my mind to skip or abandon something. Illegal practices of scientists. Doesn’t Japan have unique issues? In recent years, the illegal practices of scientists are reported in media, newspaper – domestically as well as internationally. Many factors could be considered as its background; such as global competition for achieving research results, sharp increase in research funds, stresses about the intellectual property or university venture, information disclosure, aspiration for honor, country’s prestige, etc.. There are just so many arguments going on such as the prevention and inspection of illegality by government, etc. that it is sometimes even disturbing. These are not especially Japan-specific problems. They are heard from everywhere – occasionally even cited in famous science magazines like Nature or Science. What could be done to prevent these scandals? This is entirely the social responsibility of each scientists and scientists as a whole. The Science Council of Japan published a book in collaboration with the Chemistry Fraternity on this problem. I also feel concerned about the problem, and have repeatedly discussed it personally as well as through the action and messages from Science Council of Japan. Upon the publication of the book I have written a forward, "To the people in scientific research" (in Japanese). I appreciate it if you could spare time to read it. I focused the discussion on the problem of social structure peculiar to Japanese society, which I have also repeatedly mentioned in my blog. The biggest problem is surely the people who have the biggest social responsibilities. Scandals of Association of Insurance Agencies and high government officials, illegalities of corporate executives, scandals involving politicians, etc. which repeatedly come out, all have the same composition. It is excessively poor and the autonomous function is lacking anywhere in the organization and in the responsible people who form the organization. Why it is so? Even if the scapegoat is found and punished, nothing is changed. Read this, and each one of us should think honestly and carefully about what to do and take action. Impossible? It’s a Matter of Vision and Will to Challenge! On July 3rd, after I returned from G8 Science Advisors meeting in beautiful Slovenia, I had a briefing in Press Center, Tokyo, with foreign correspondents on ‘Cool Earth 50’. I thought the session went well with a lot of questions and discussions. I received more than few e-mails from those who attended this briefing, saying it was very enjoyable because I was quite open, frank and receptive to any question, thus quite different from any previous press briefings by the Japanese government officials. They indicated that government press briefs are not so amicable and usually provide little more than what are already on the web. Of course, this may be the case since the government officials are extremely cautious what they say. In addition, they have to deal with foreign press in English with the language barrier. Mr. Von Martin Koelling reported my interview in Technology Review (in German) and I enjoyed reading his report. Its English translation, with some editing by me, is here for you to read. Enjoy it. "Impossible? It’s a Matter of Vision and Will to Challenge!" Red Herring Conference in Kyoto cited in my earlier blog, now appeared as a feature of recent issue of Red Herring, only in web-publishing format. In this issue, notes and articles on Japan appear in p.4 and p.15~30, where my commentaries are cited few times. Enjoy it. I arrived at Beijing from Abu Dhabi via Dubai on 24th October to participate in the conference of WHO Commission. This year’s conference was held at Geneva in January and at Vancouver in June. We are working hard towards the release of the final report which is scheduled next year. Things being at this phase, the programs were mainly closed sessions by the Commissioners. On 24th, Vice Minister of Health that commensurate with Ministry of Health, Labour and Welfare in Japan (Photo1) hosted dinner. The Vice Minister is a surgeon with specialization in liver transplantation etc. I hear that even today, he sometimes does surgeries in the hospitals. 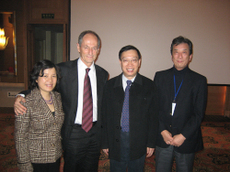 Dr. Chen Zhu, my old friend, whom I have known through IAP etc. for more than 5 years, is the Minister of Health. Unfortunately, we could not meet this time. 26th was the final day of the conference. Late in the afternoon, many flights from Beijing airport were cancelled due to fog. Fortunately, my flight departed with just 1 hour delay and I reached Narita at 10:50 p.m. However, there was neither a bus, nor a train or a taxi at that time of a day. I couldn’t believe it! Is this an international airport in the capital of a country of "Giant Economy"? Next day 27th was a rainy Saturday as typhoon was approaching. I have attended the anniversary symposium of "Life and Medical Sciences" at Doshisha University organized by Dr. Hirofumi Uzawa, whom I very much respect (I have mentioned his name many times in this site, so please search it). 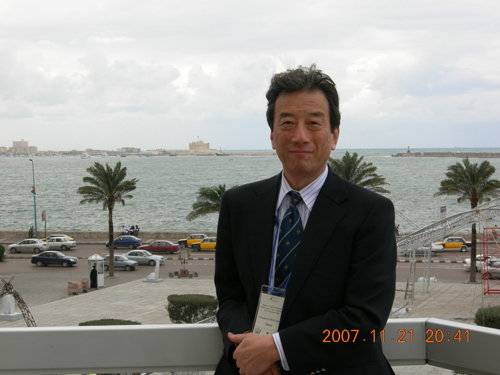 Dr. Uzawa wrote a prospectous of the symposium （PDF）which conveyed his great enthusiasm. In it, he mentioned about my "University Hospital Revolution." I was happy, honored and shy at the same time. Not knowing so, I have arranged to give the book to all the participants so it turned out to be a good timing. Photo2: With the always energetic Dr. Uzawa. I really enjoyed talking with him. Afterwards, the speech of both Dr. Uzawa and myself (the beggining of my speech was also used in the Lecture at Helsinki this August) was introduced in a blog (only in Japanese) very positively. I was glad and sent comments of gratitude to the writer.